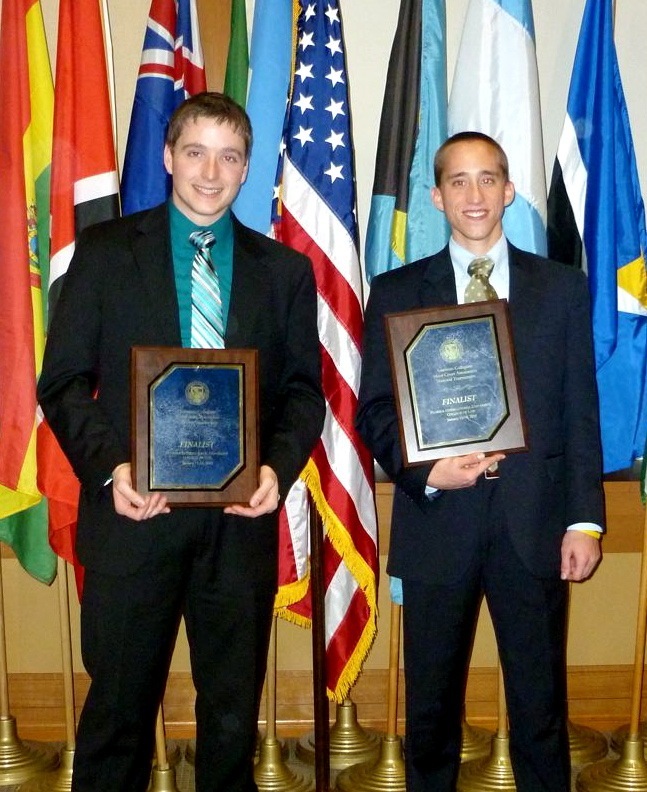 Congratulations are due to Erik Baumann (Philosophy, 2010) and Ray Panneton (Political Science, 2010) who earned second place in the 2010 national tournament of the American Collegiate Moot Court Association (ACMA). Chosen on the basis of regional competitions, the nation's top 64 teams competed in the tournament last weekend in Miami, hosted by Florida International University's College of Law. Erik and Ray, who came into the tournament as the southwest regional champions, advanced to the final round, defeating three other regional champions along the way, including the tournament's top seed. Baylor was one of only a handful of schools to send multiple teams to nationals. 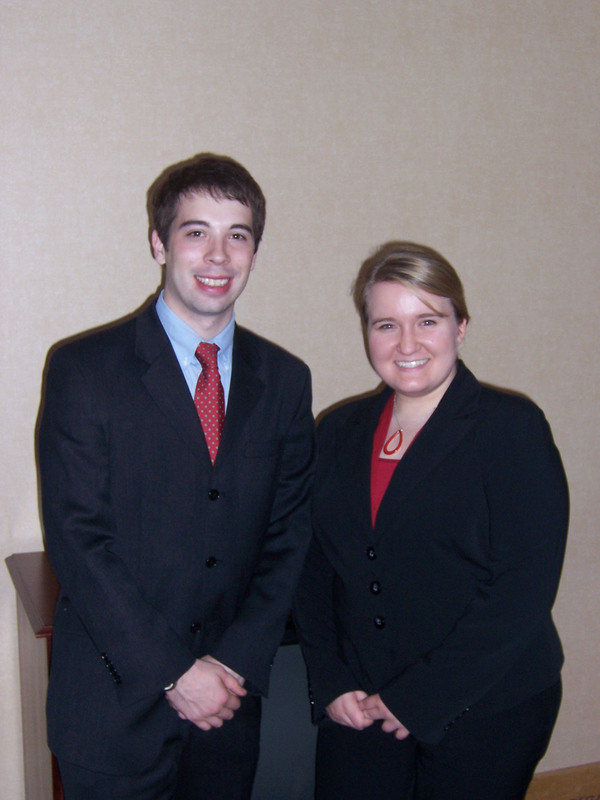 David Matthew (Political Science, 2010) and Meaghan Nowell (University Scholars, 2011) also made a strong showing in the tournament. 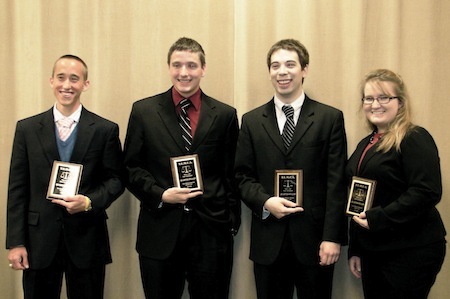 See HERE for more information about the Moot Court team's national ranking. The Baylor Undergraduate Moot Court Association partnered with the Law School to host an intercollegiate moot court competition this spring. Baylor Law has the finest facility in the state, so the tournament is a prime opportunity for the Law School to recruit some of the brightest prospective law students in the region. It also gives Baylor Undergraduate Moot Court an opportunity to further build on the foundation of excellence built during the year. 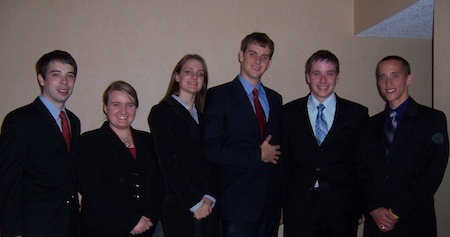 In a tournament hosted by the Texas Tech Law School (Nov. 6-7, 2009), Baylor came away with a win in more ways than one. 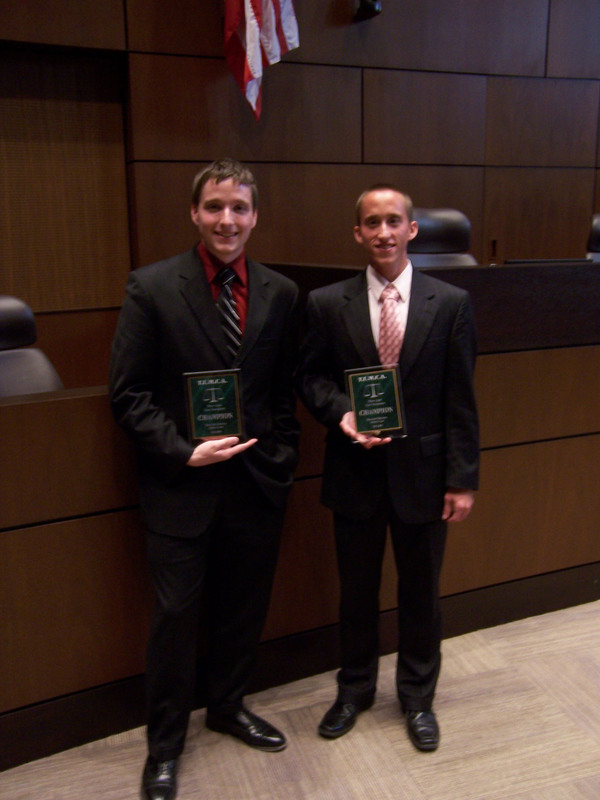 Erik Baumann and Ray Panneton took home the first place trophy, arguing in the final round before a panel of judges that included former Attorney General Alberto Gonzalez, while Meaghan Nowell and David Matthew finished in the top four. Both teams earned berths in the national championship tournament to be held at Florida International University in January. round. Former U.S. Attorney General Alberto Gonzalez is in the center. Baylor made a strong showing in its first tournament of the year (Oct. 30-31, 2009). Texas Wesleyan School of Law hosted the 50-team tournament, which included teams from UT-Austin, Texas Tech, Texas A&M, University of Dallas, Arkansas State, Howard Payne, North Texas, and UT-Arlington. Baylor was the only school to place two teams in the quarterfinals. And congratulations to Erik Baumann who took home one of the tournament's top speaker awards.